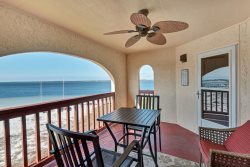 You will be feeling "Just Beachy" in this 10th floor unit with breath taking views from the private balcony. This nicely decorated 1 bedroom with bright colors sleeps 6 comfortably. The secluded master bedroom has a king size bed and flat screen TV/DVD, perfect for putting up your toes after a long day in the sand. The bunkbed in the hallway alcove, and queen sleeper sofa are perfect for guests and little minnows visiting with family. Navarre Beach is a wonderful vacation place for families who enjoy nature walks, dolphins, white sand and leisure days spent in the sun. Always well pleased every time we stay at Summerwind. Professional staff, clean, well furnished, great pools, and a breathtaking view! I had to change dates so I had to call and discuss options. Everything was changed and updated and went very smooth. Very nice and will look to come back soon.